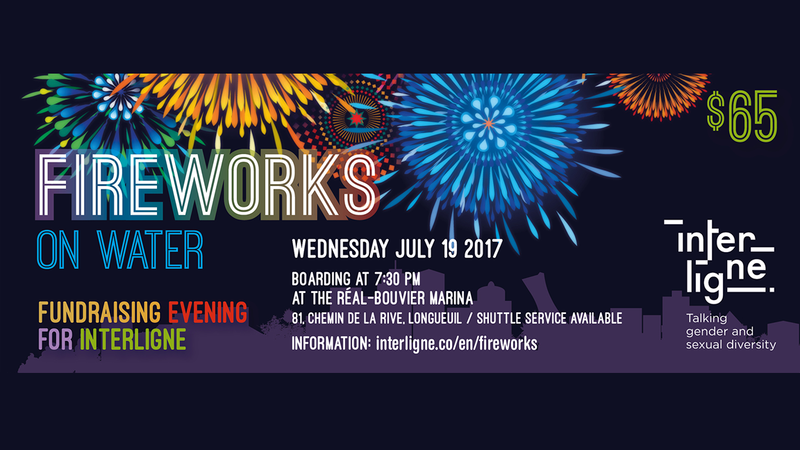 Interligne (formely Gai Écoute) is very proud to invite you to its “Fireworks on Water” fundraising evening on July 19 2017. Join us for a 3 hour excursion on the St. Lawrence River and enjoy one of the best views to admire l’International des Feux Loto-Québec. Join us to enjoy a unique experience at this festive evening in an enchanting setting! 1) Go directly to the boarding place for 7:30 pm. Free parking is available at the marina. 2) A shuttle service will be available from Montreal. Be at the Préfontaine metro station at 6:30 pm. The shuttle will take you back to the starting point after the event. You can not participate, but you want to make a contribution to Interligne (formely Gai Écoute)?